HOT IN THE SHADE: Sweltering in the Texas heat outside Michael's downtown Austin hotel room. Waller Creek is behind us. The legendary glam-rock singer caused quite a stir when he arrived unannounced later this evening and walked through Emo's during SXSW 2004. 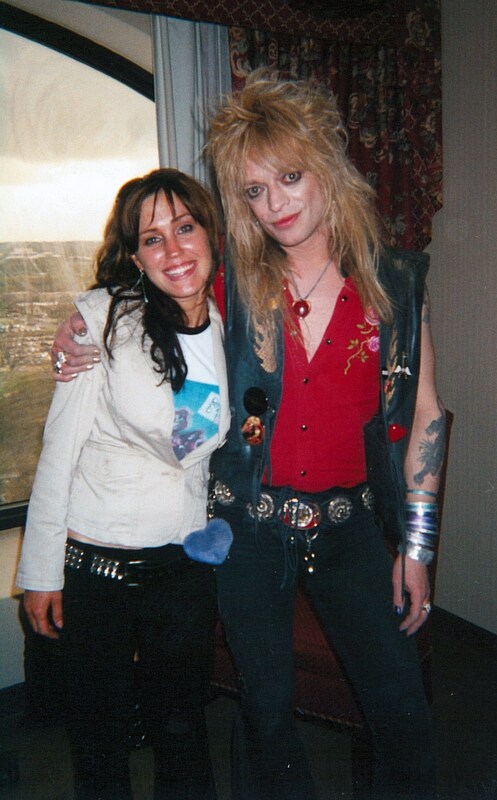 After meeting Michael Monroe in a downtown Austin hotel room, I’m fully convinced the glam-rocking twister sleeps in his leather pants. Working off a tip from publicist Brandon Stratton, my wife and I rode up the hotel elevator and knocked on Michael’s door. 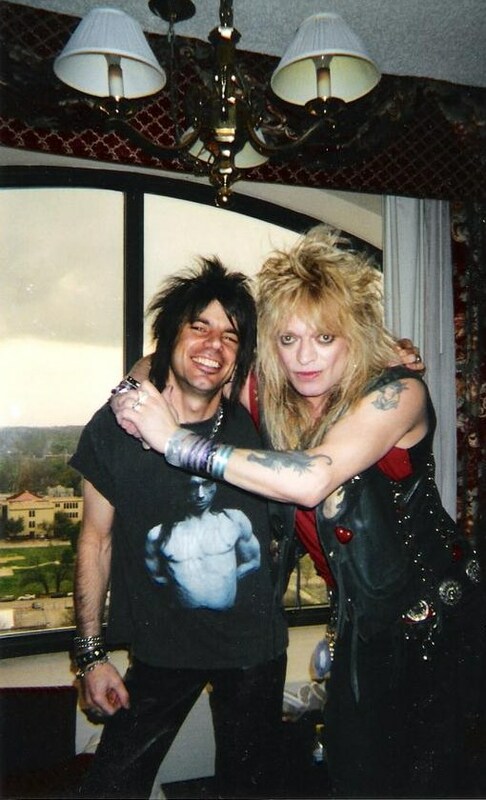 Brandon answered wearing a Hellacopters T-shirt and asked us to wait in the hall for a few minutes while Michael wrapped up a previous interview. I remember feeling sick and queasy from consecutive nights of SXSW, but excitement was finally coming to cure me. Michael, of course, is an iconic rock-n-roll legend who is worshipped by Guns N’ Roses, Skid Row and basically the entire 1980s hair-metal genre. He also carries a heavy dose of punk-rock street-cred, which made me the envy of all my gutter-rat friends who knew I was booked for some face time. As my urge to vomit subsided, Brandon returned and waved us in. ROOM SERVICE: In Michael's hotel room. The man is a 24-7 rock star who didn't mind my pathetic request for a second round of photos. Expecting Michael to be dressed-down on his rare day off from the stage, I was surprised to find him glammed to the max in all his black-leather gypsy regalia. Wow! This is how he looks when he’s holed up in a hotel room with nowhere to go? Really? Now THIS is a turbo-charged, superhero ROCK star! Surely, he must at least have a photo shoot today (I think he did … but trust me, the glitz is permanent). Michael’s hair was perfectly ratted; his jewelry was a-clinkin’ and a-clankin’; and his flawless makeup could have turned Dolly Parton three shades of green with envy. The man was a marvel of gravity-defying swagger and cool. And could he have been any nicer? Actually, no. I rolled tape and asked questions for an hour as Michael charmed the living crap out of me and my wife. If Michael was a disease, he’d be highly contagious — and certainly terminal. What a gracious host. We finished the interview, took the obligatory photos and said adios. Riding down the elevator, my wife and I stared wide-eyed at each other. Did that really just happen? I’ve interviewed my share of rock stars before, but Michael oozed that rare kind of 24-7 electricity that left me hopelessly giddy. Then it hit me. What if the photos didn’t come out? What if they’re blurry or too dark? What if? What if? Lacking the luxury of a digital camera and not trusting my crummy point-and-shoot, I felt the anxiety fraying my nerves. We gotta go back! With coaxing from my loving wife, I trashed my journalistic credibility (and every ounce of pride) and quickly reversed the elevator. Back in front of Michael’s door, I stopped cold and hesitated. And then … I hesitated some more. OK. OK. Pull yourself together, man! Back in the room, Michael again welcomed us with open arms (literally) and gladly took another round of just-in-case, backup photos. In fact, it was he who suggested we take a few pictures by the window and then a few over there and maybe a couple right here and then some outside … All good, then? Absolutely! As you can see, I got my prized photos, but I also made a friend in Brandon and caught a rare case of star-struck that may never be cured. Awesome Dave i remember that night at Emo’s with Michael walking round the place. That was very cool of him having met him myself twice now, i totally agree with what you’ve said here.. A Class act and some.. Brandon great person as well,l hat’s of to him for sorting this out.. Yes I you were the envy of this one of your rat friends that day. Man I posted on face book a great article from a month ago that the wall street journal did on Monroe. Its a great read if you get a chance. Good story as always 2Fast2Die!!!!! 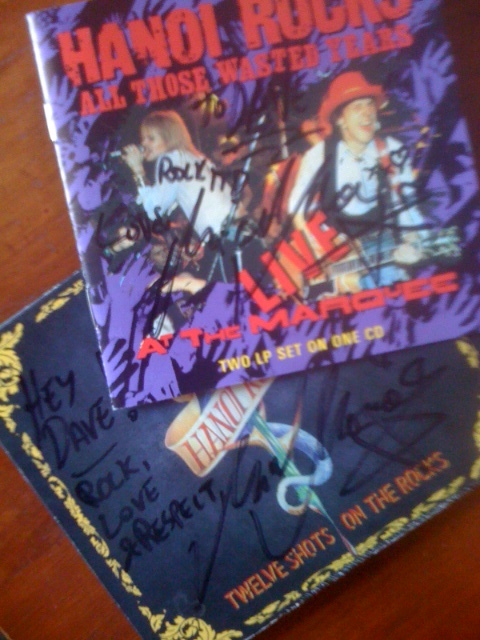 One more thing, I think that the last 3 albums the reformed Hanoi Rocks did were awesome. 12 shots on the rocks, Another hostile takeover, and Street Poetry. They had some gems on those records and the last two were only available as imports in this country. 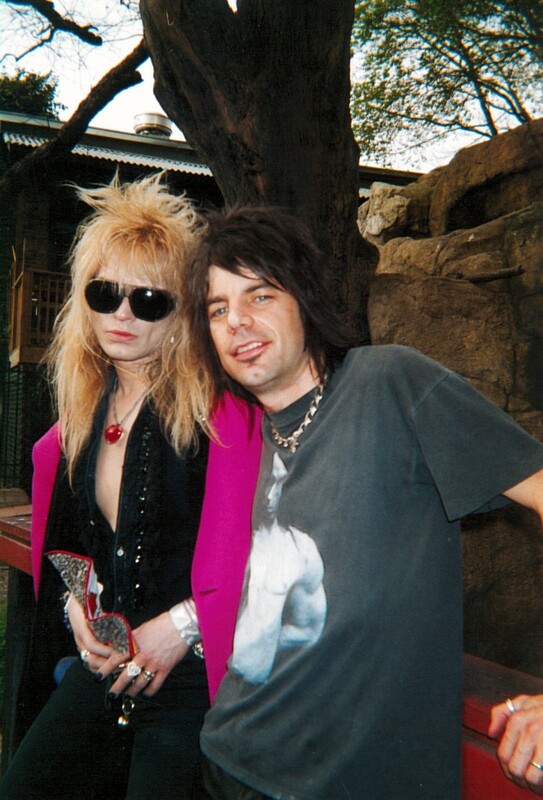 I dont see Mike Monroe hocking chicken fingers and double cheese burgers for fast food chains! However I think I would let that go because he probably needs a couple of bucks unlike another lead singer I will not mention!!!! Cheers!